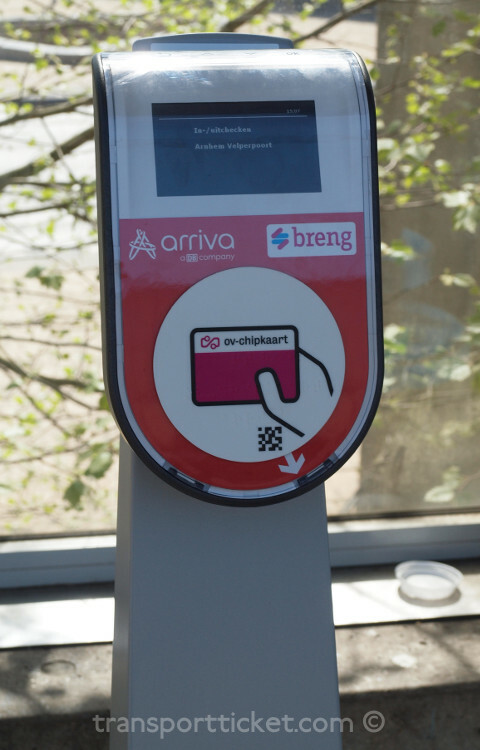 The Dutch ov-chipkaart can first be used on the ferry Flushing - Breskens since December 2004. 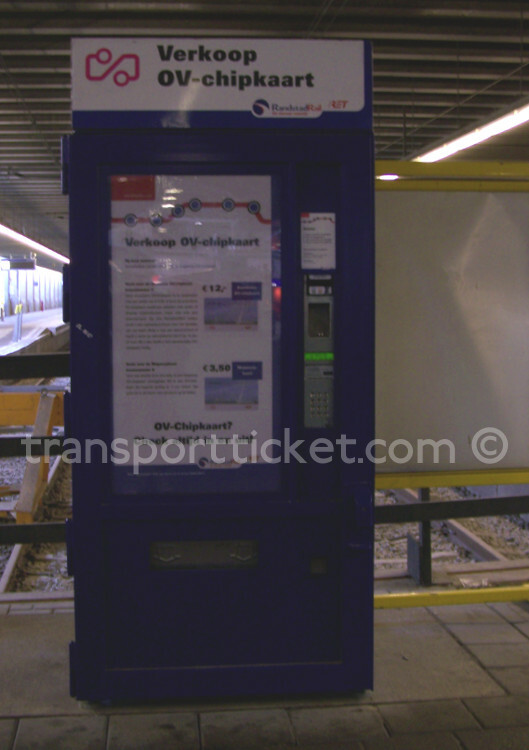 Several months later, in april 2005 the ov-chipkaart is tested in the Rotterdam area. 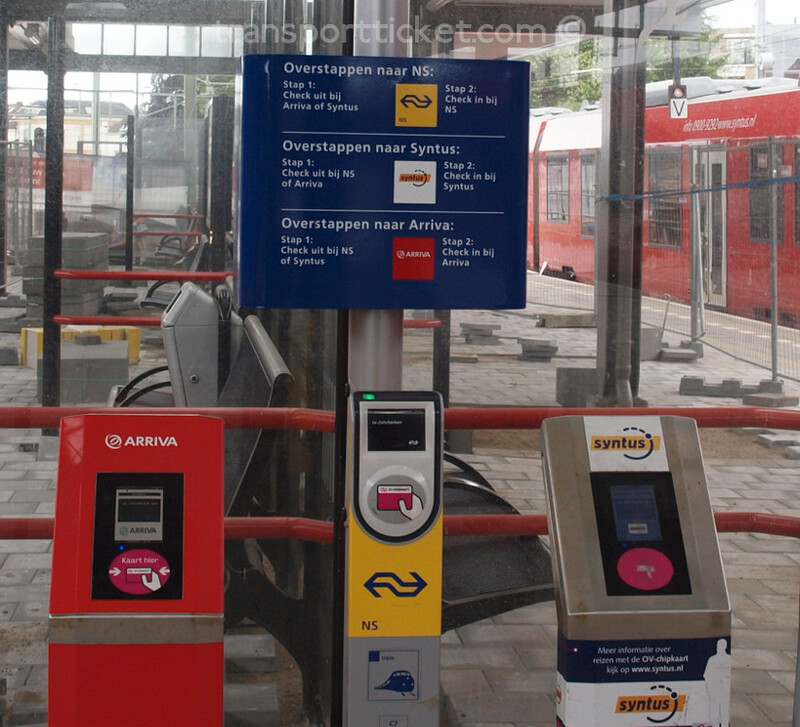 Passengers can use the smart card in the metro, buses and the train from Rotterdam to Hook of Holland. 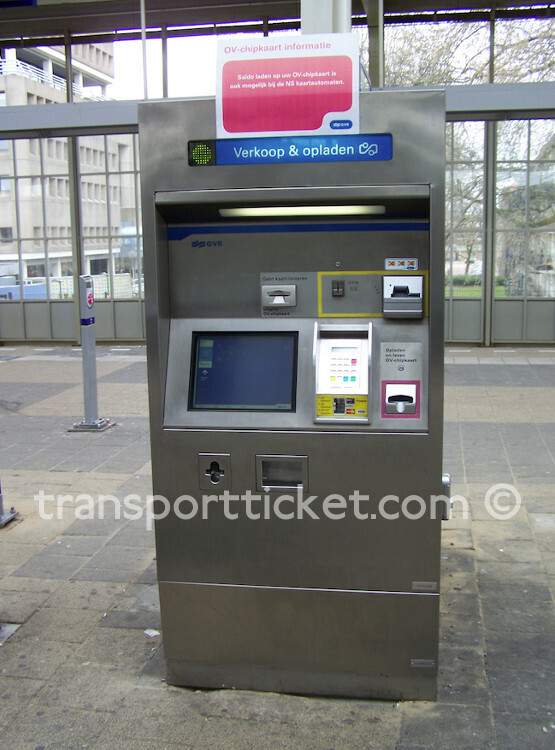 In the following years the ov-chipkaart is introduced in more areas. 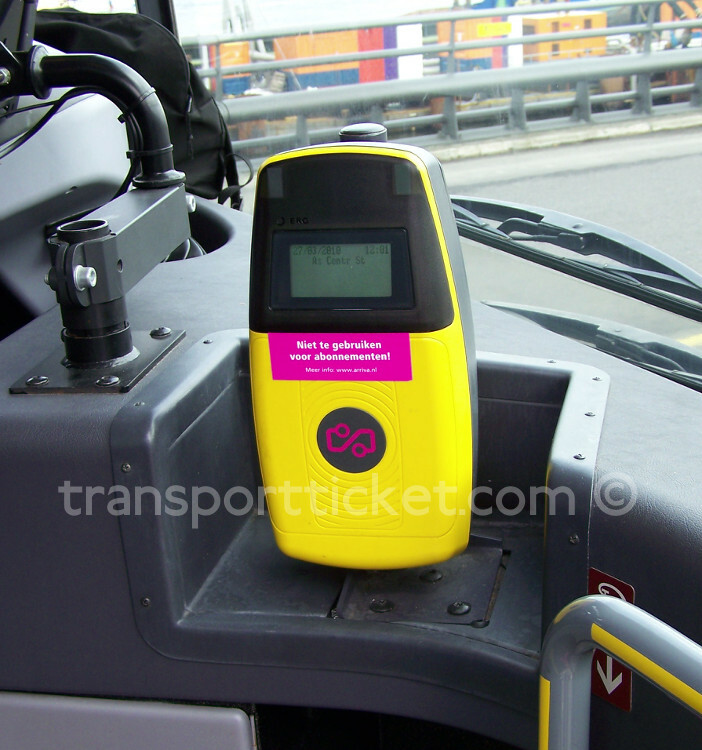 Other transport tickets are gradually terminated. 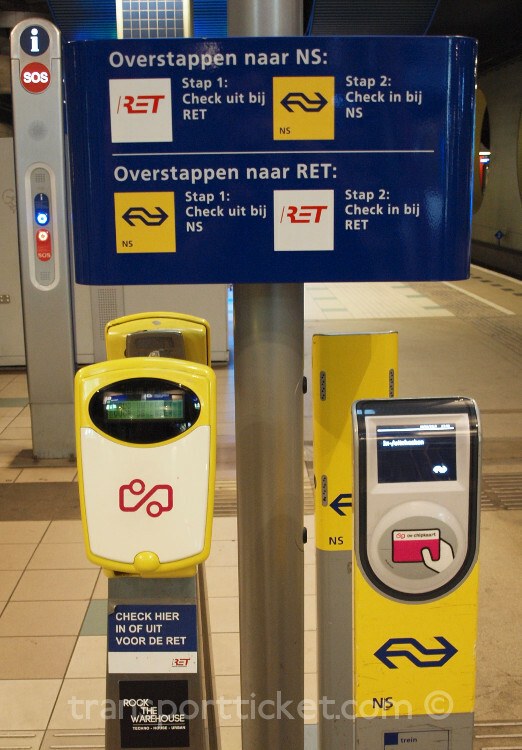 Per 2011 the smart card can be used everywhere in the Netherlands. 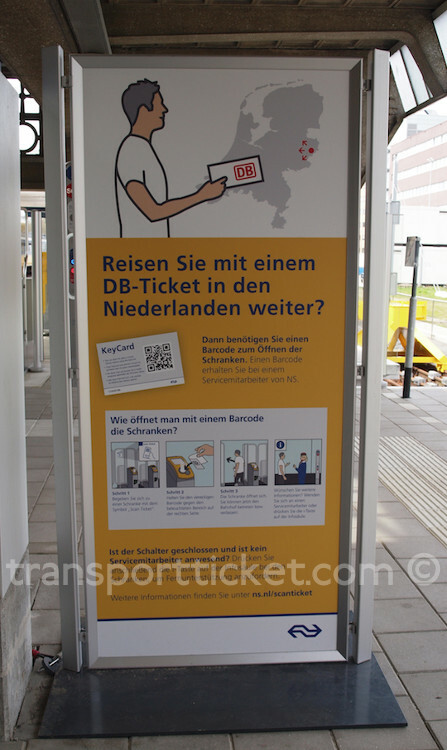 Even though the card has been released in the last regions in November 2011 it's still possible to travel by using other transport tickets. 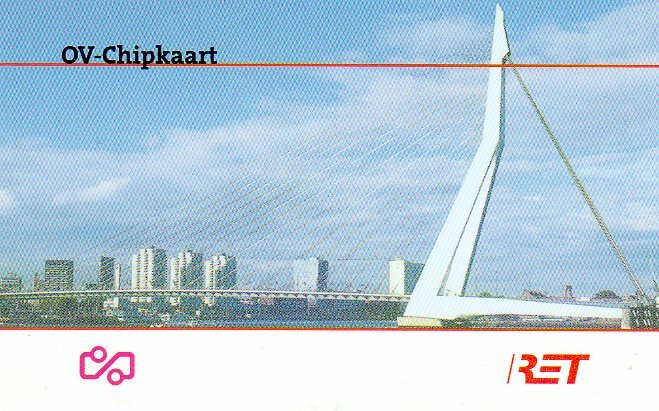 There are 5 different kinds of cards. 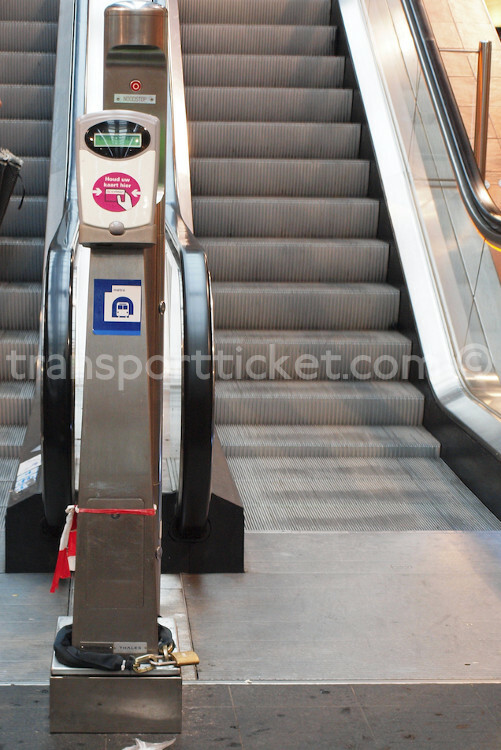 Travellers have the possibility to use a travel product (like a year pass) or credit for 'pay as you go'. 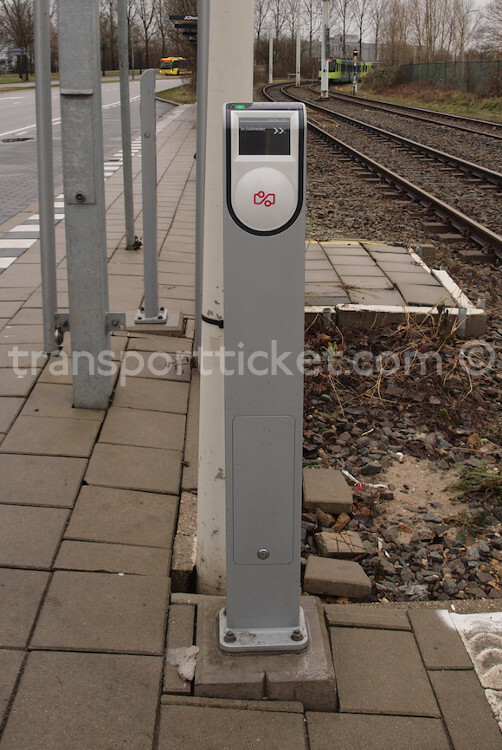 Travelling by credit means the smart card is used as an electronic wallet. 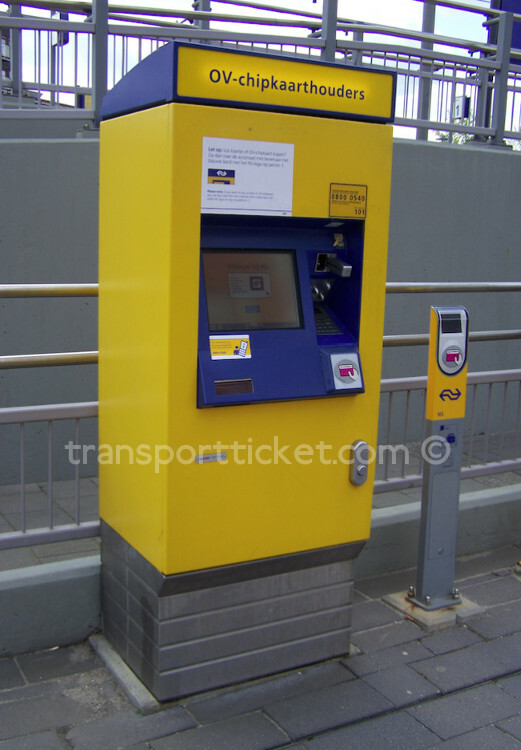 By touching in and out the fare of the ticket will be charged. 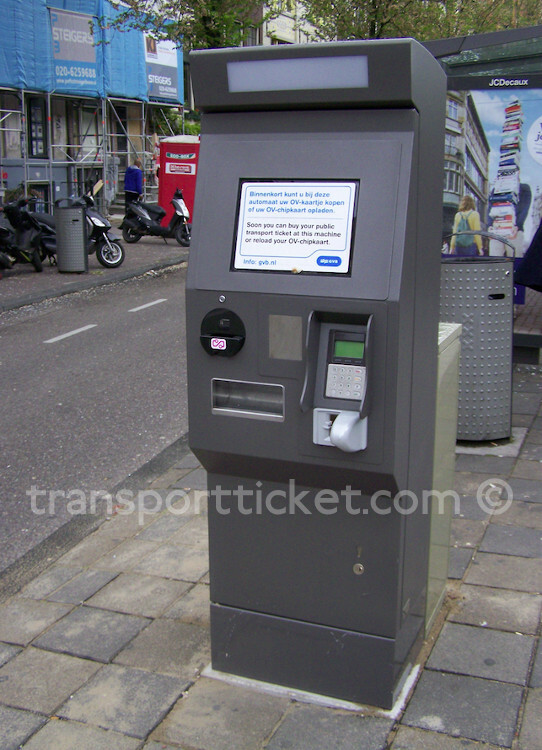 A travel product can be like a year pass, a day rover or a single ticket. 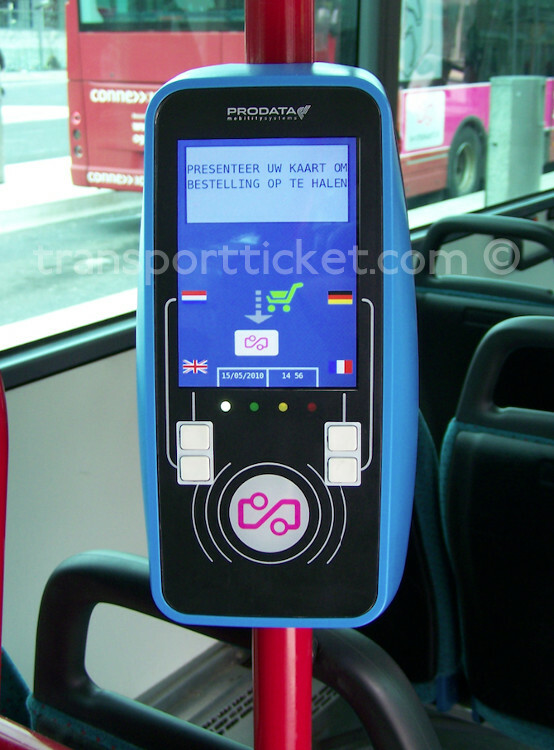 By touching in and out the validity of the travel product will be checked. 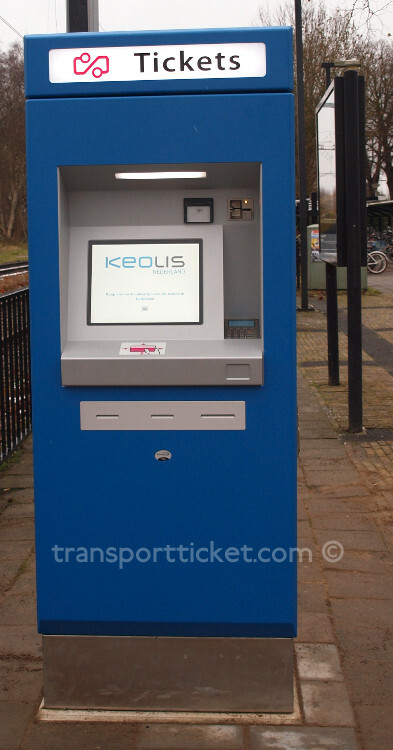 When the travel product is invalid for (part of the) journey, credit will be charged for the remainder of the journey. 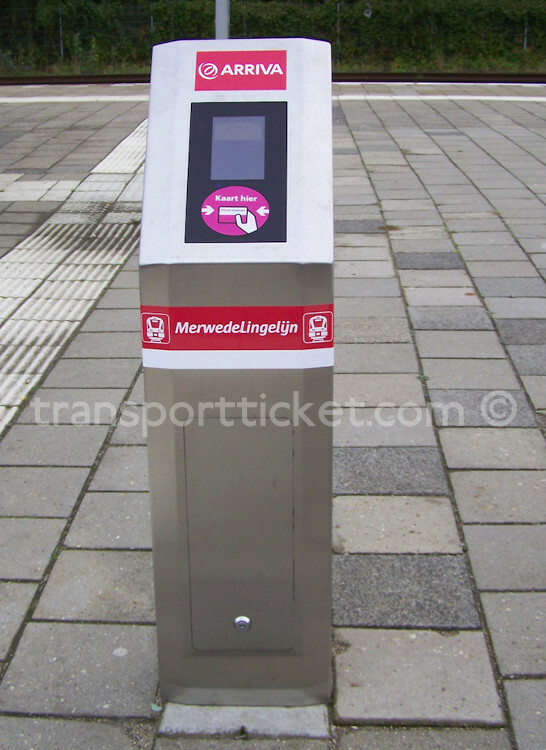 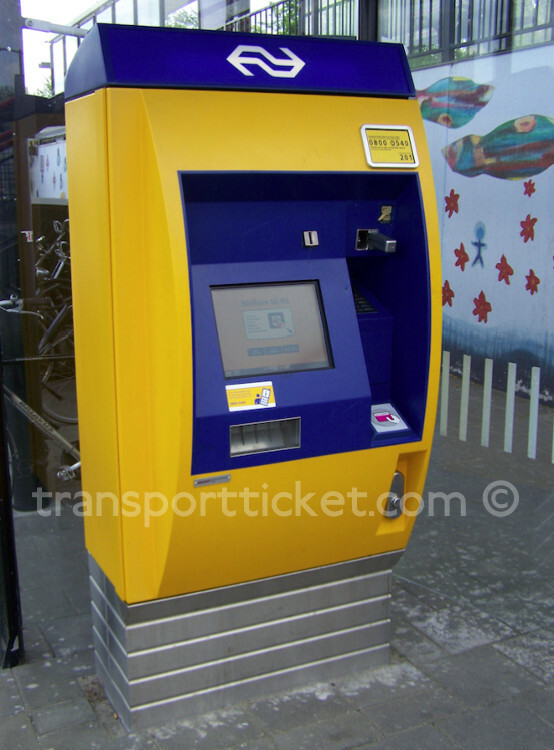 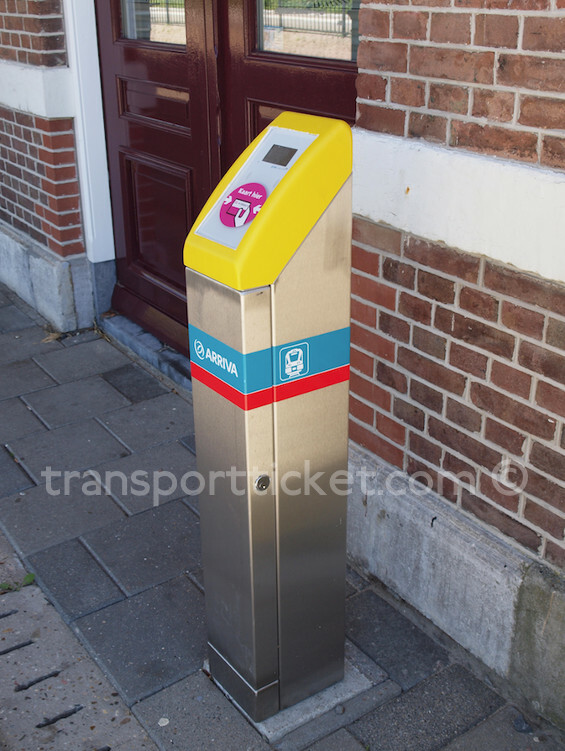 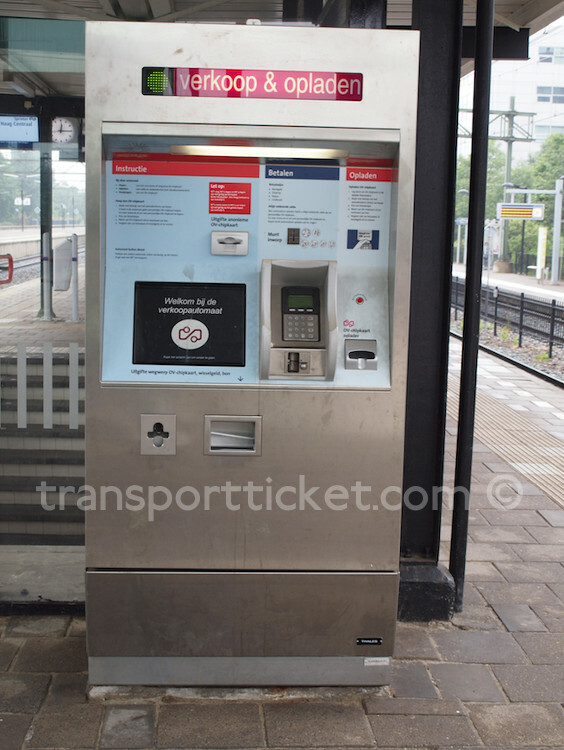 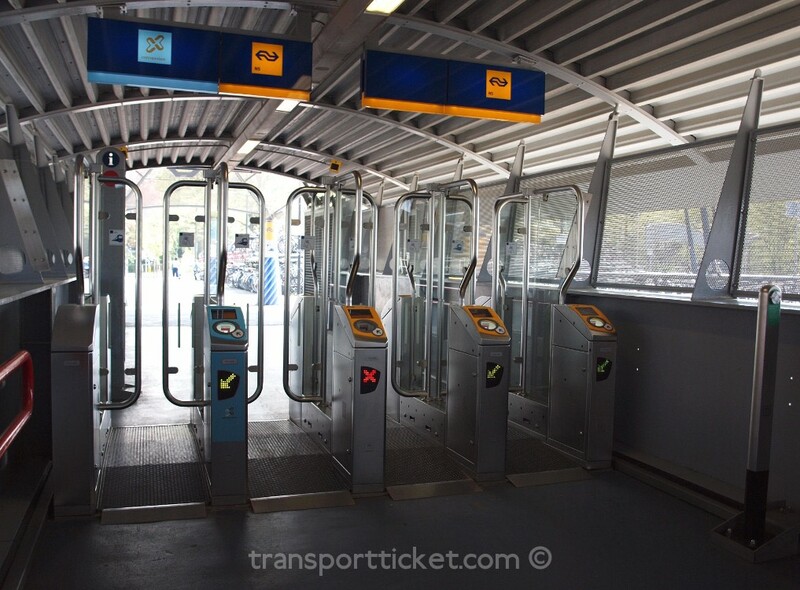 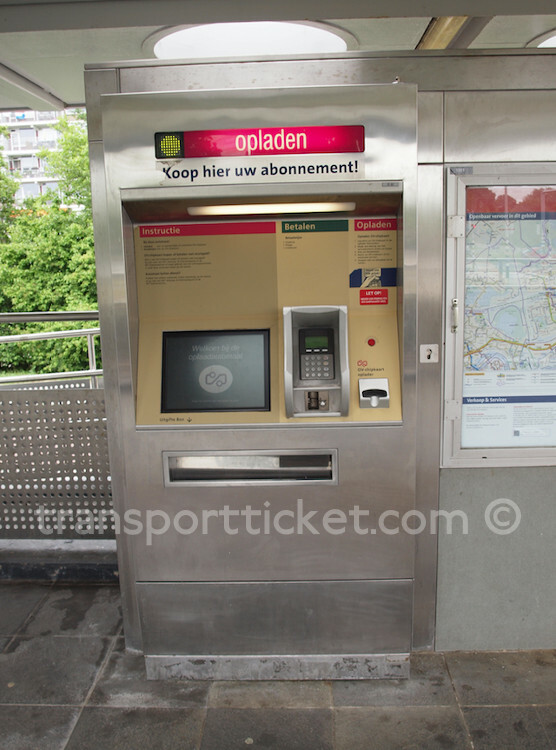 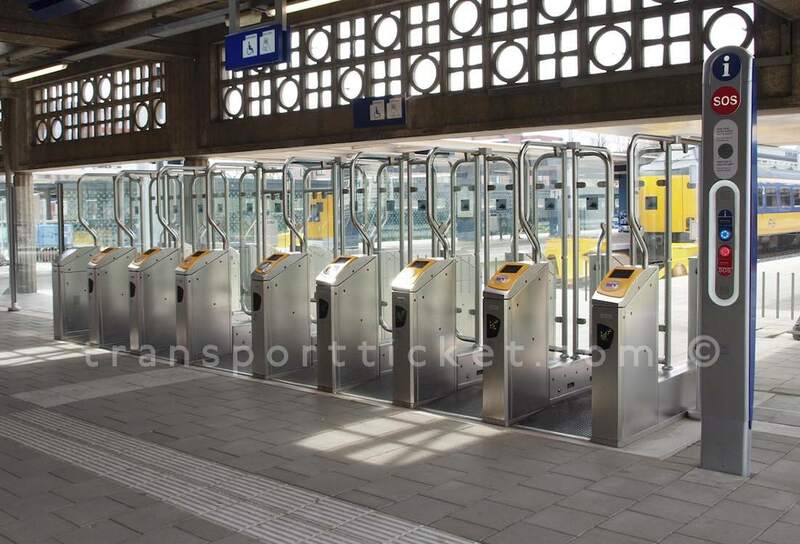 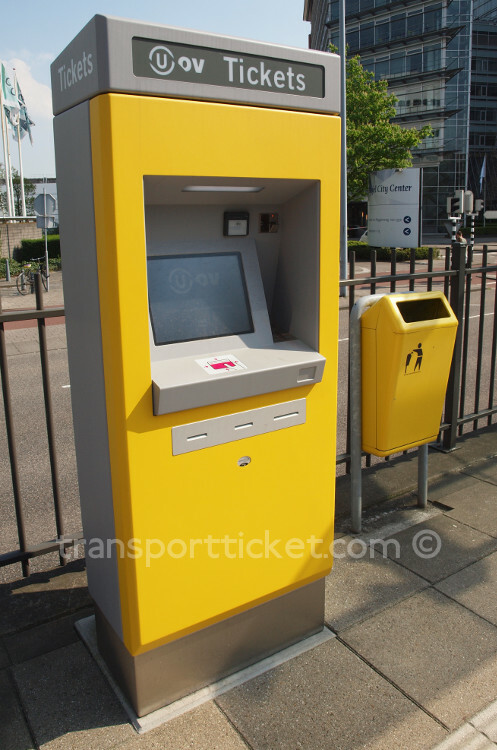 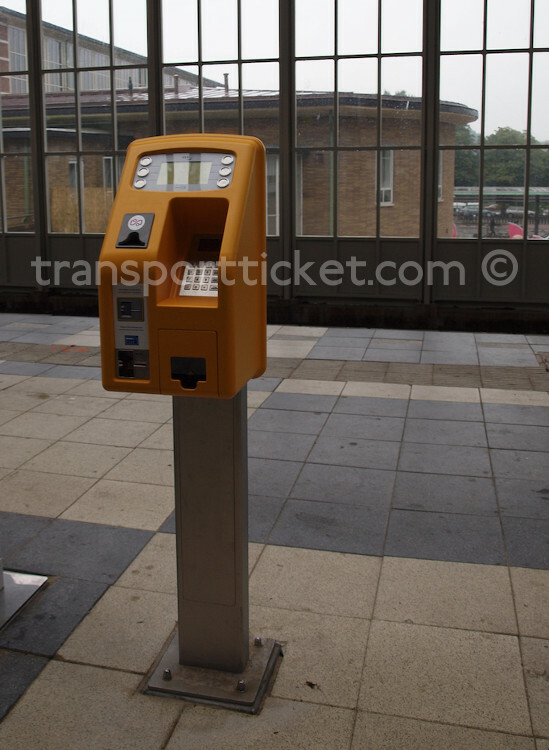 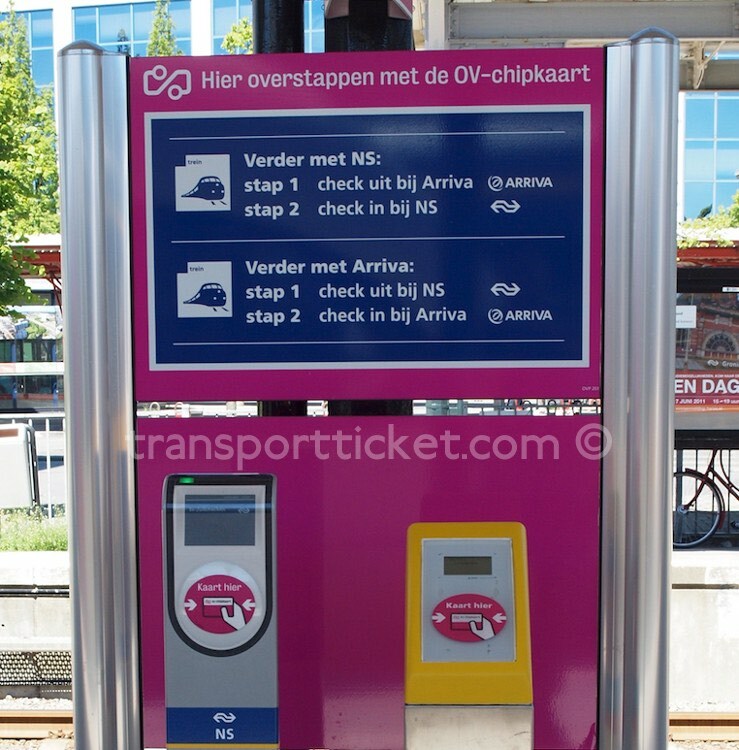 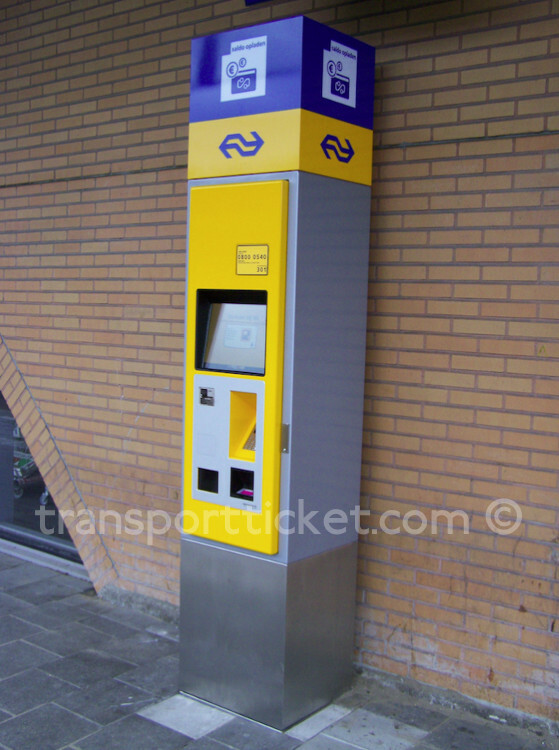 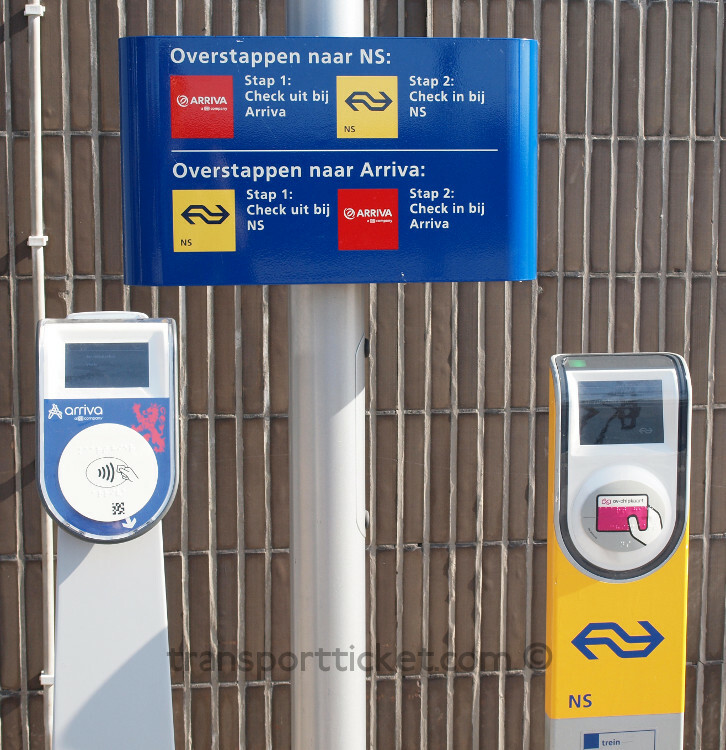 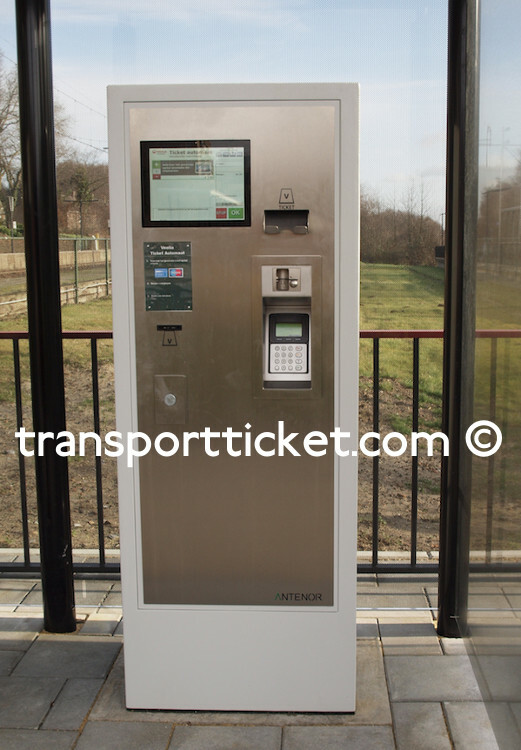 The ov-chipkaart integrates ticketing on all modes of public transport in the Netherlands. 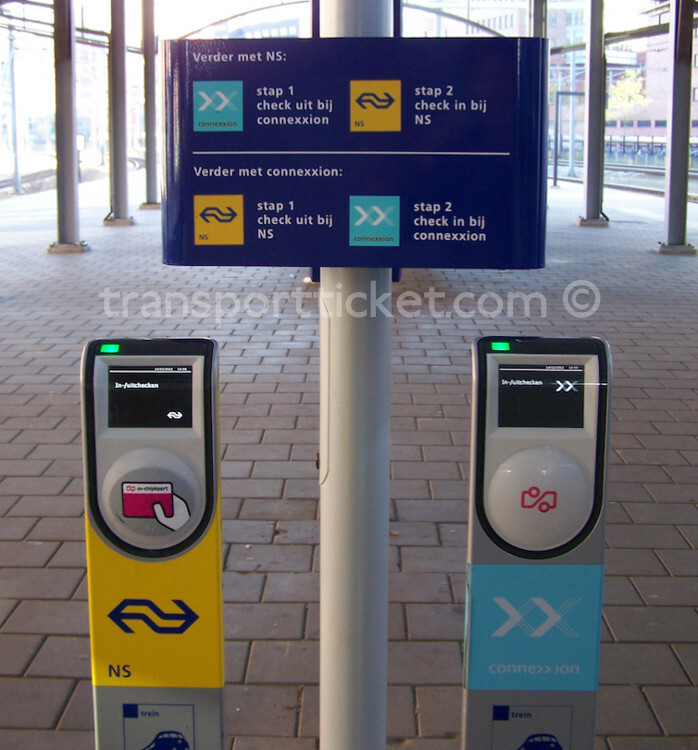 However, it does not integrate fares. 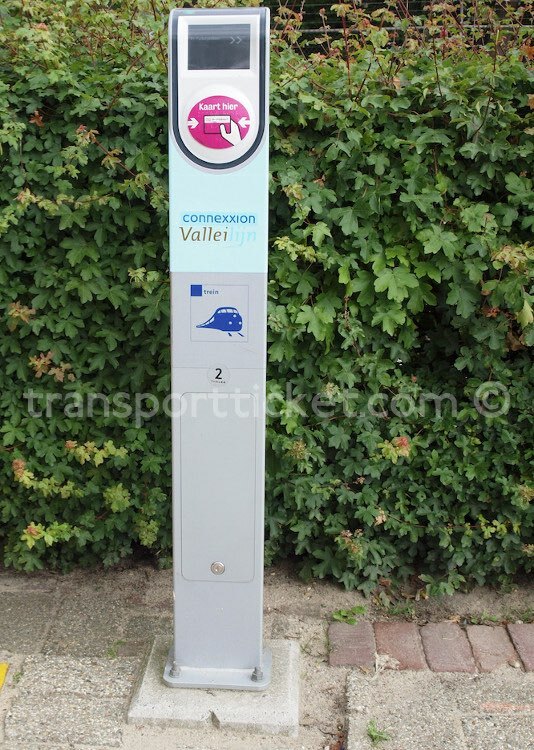 Depending on the mode of transport the passenger touches in and out in the vehicle or at the platform/station. 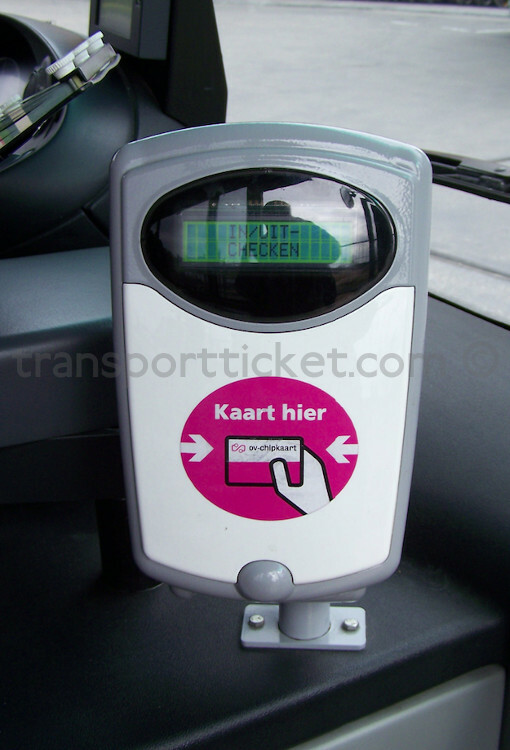 If the passenger changes to another vehicle he touches out in the first vehicle and touches in in the second vehicle. 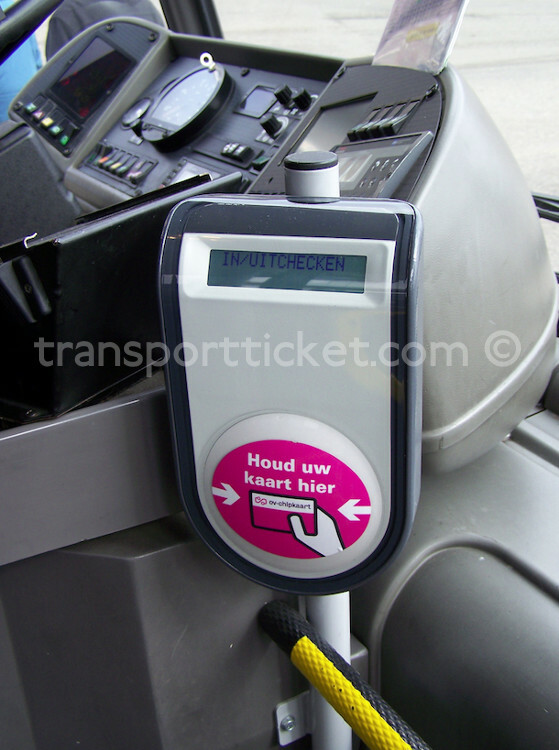 If the passenger changes to another vehicle and the transport company stays the same, touching out and in isn't required. 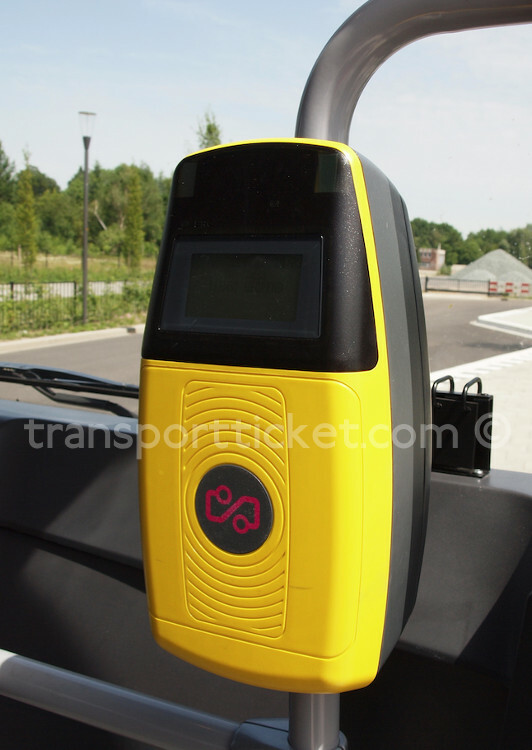 If the passenger changes to another vehicle and the transport company changes as well, the passenger is required to touch out at the validators or gates from the first company and to touch in again at the validators or gates from the second company. 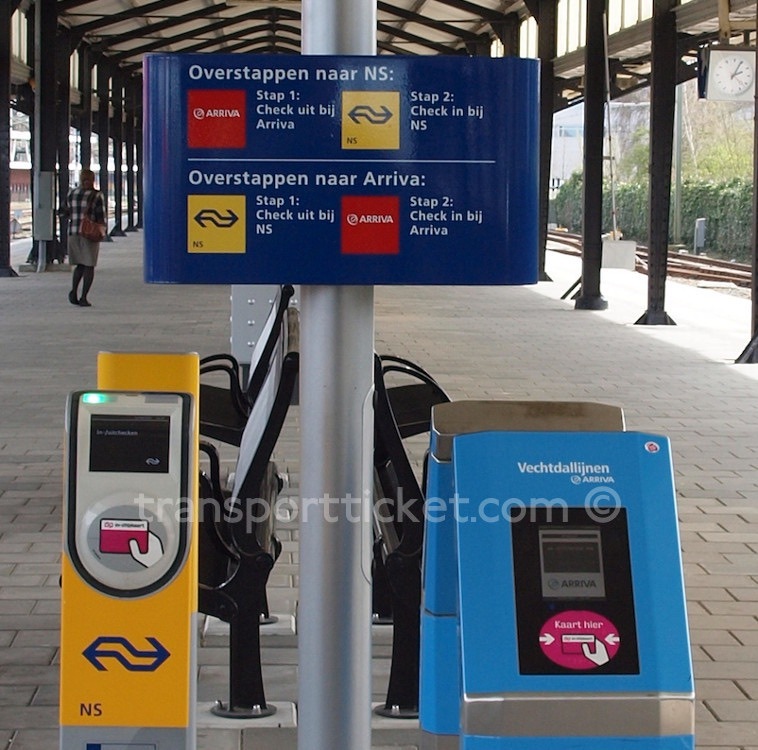 A higher fare will be deducted of the credit on the card if the passenger touches out and in in the wrong order. 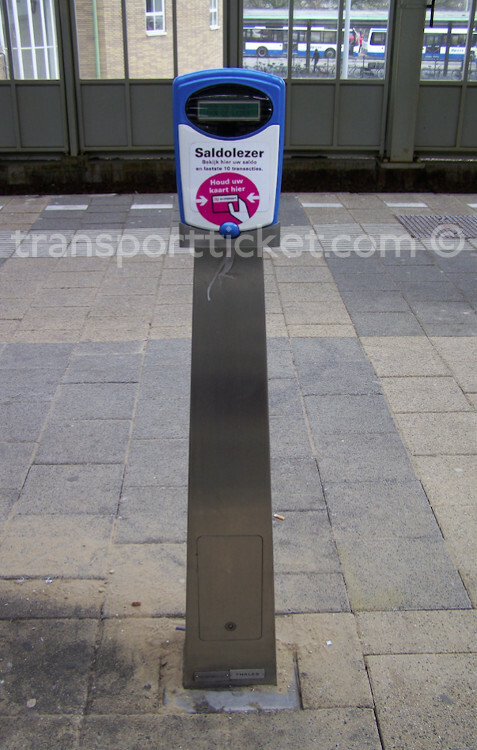 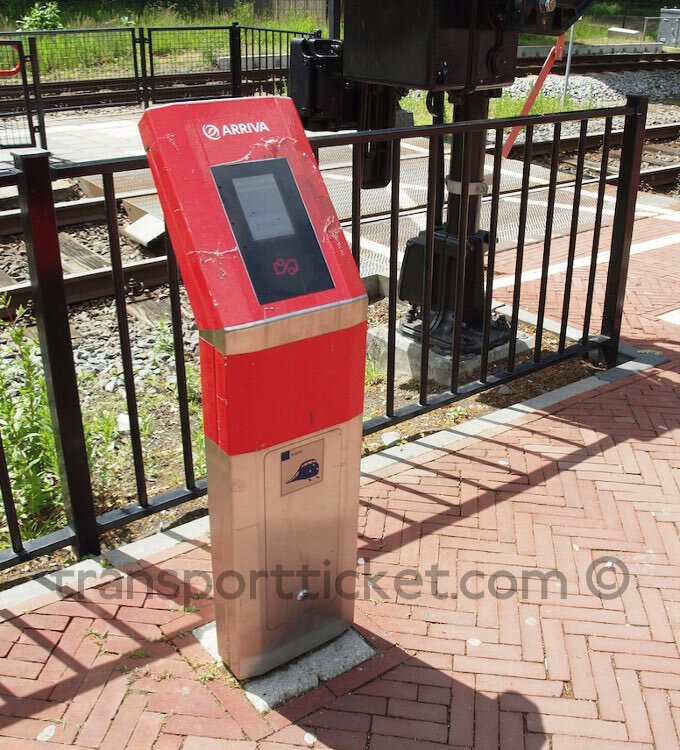 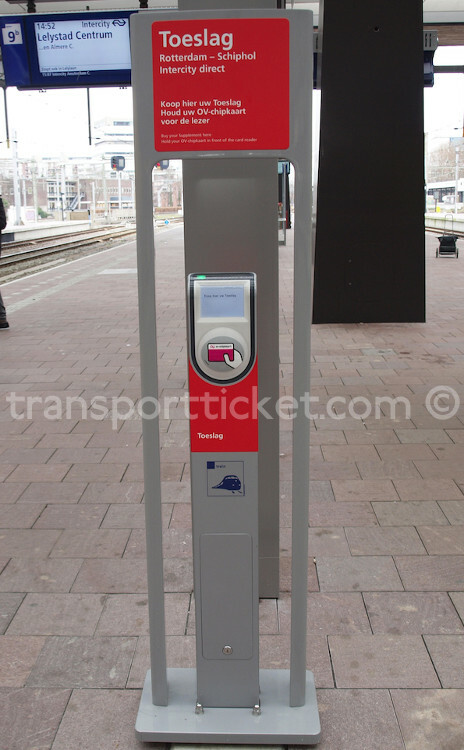 At most subway stations in Rotterdam and Amsterdam and several Dutch railway stations ticket gates have been installed. 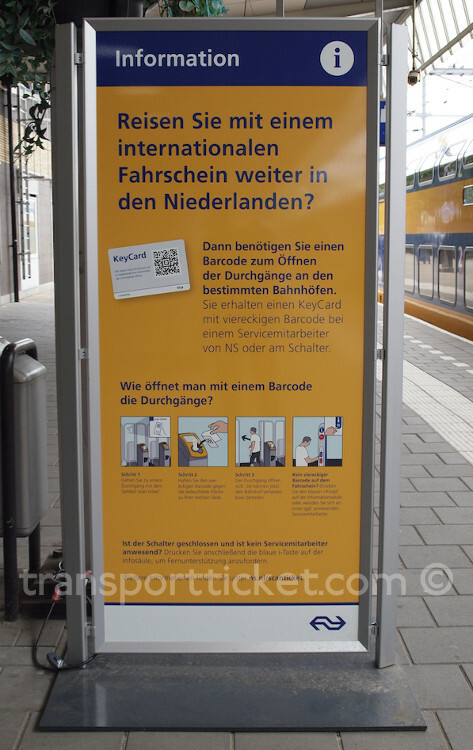 key cards (for international travellers using a ticket without a QR-code). 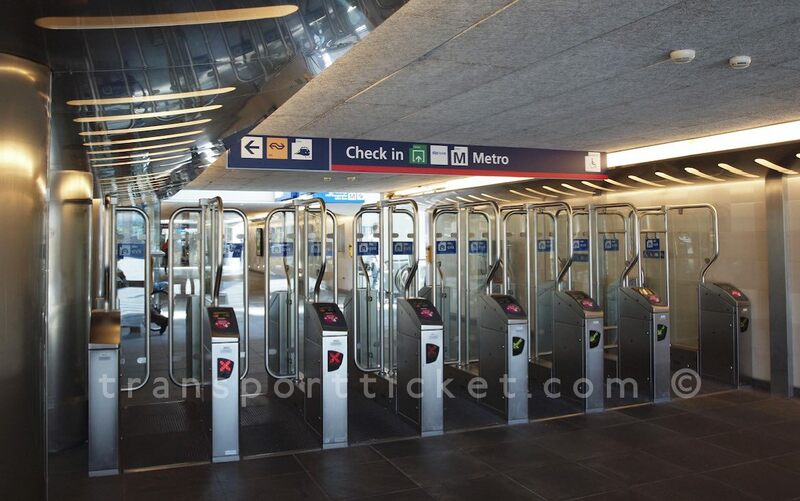 Validators have been placed at stations without gates for touching in and touching out. 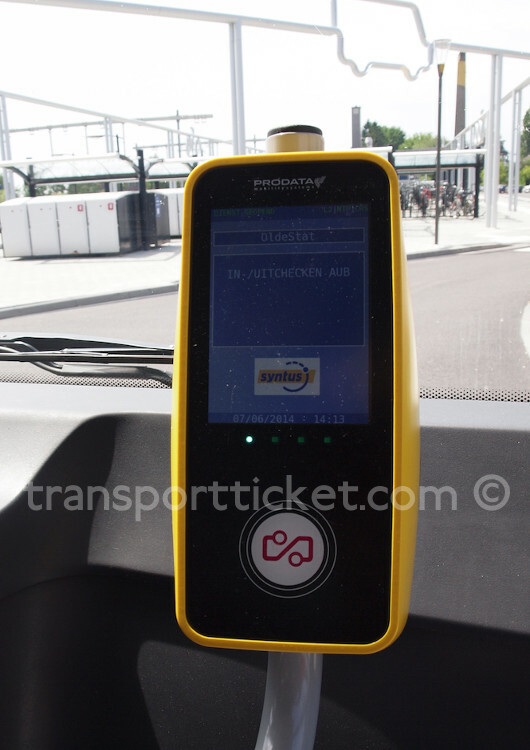 If a traveller changes transport company during his trip, he has to check out at the validators of the first company and check in at the validators of the second company. 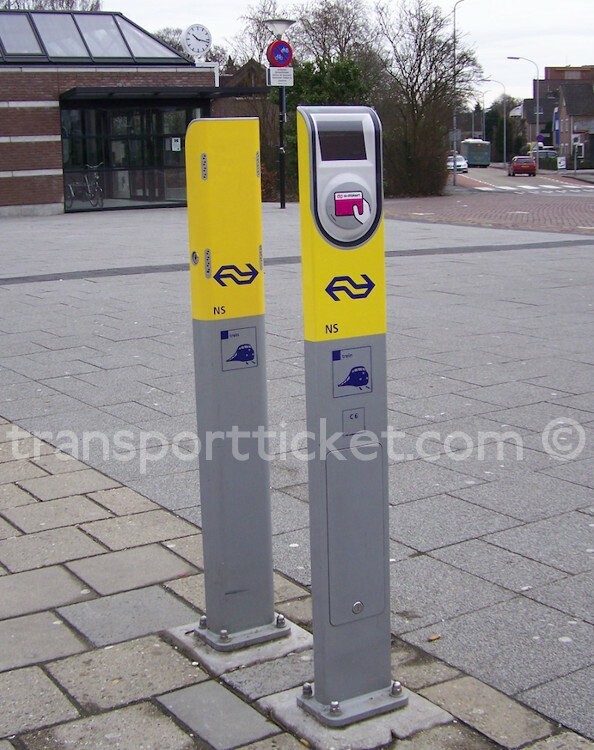 Only Zutphen has a transfer point for three railway companies. 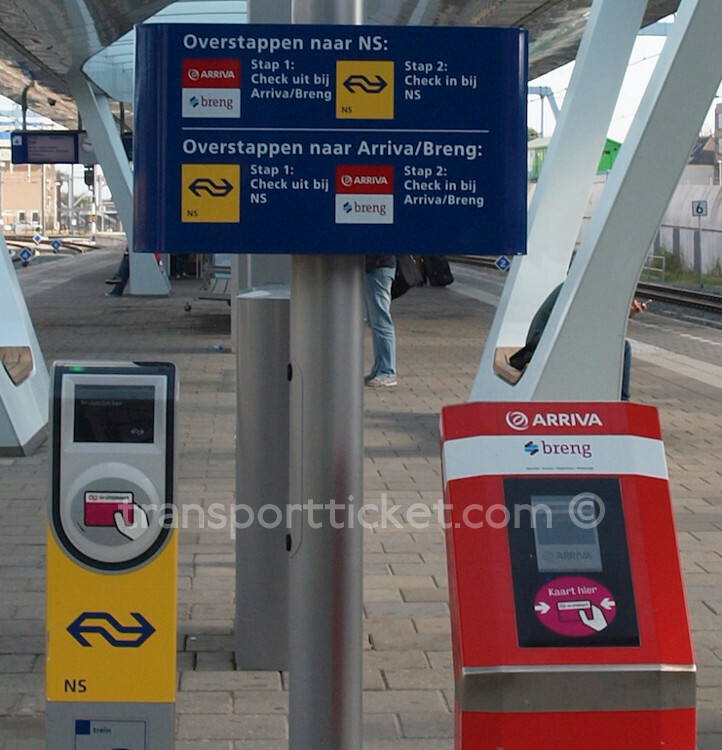 There are a couple of other stations where trains of three or more different companies depart. 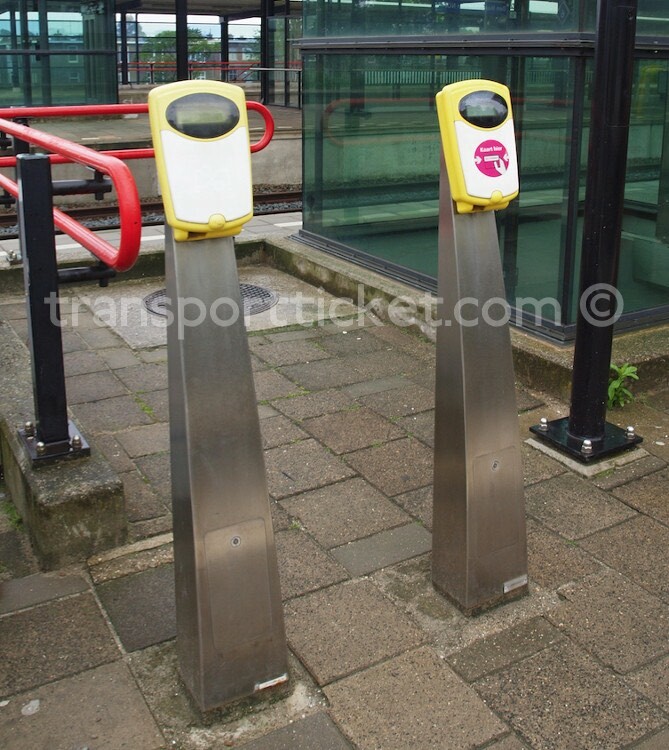 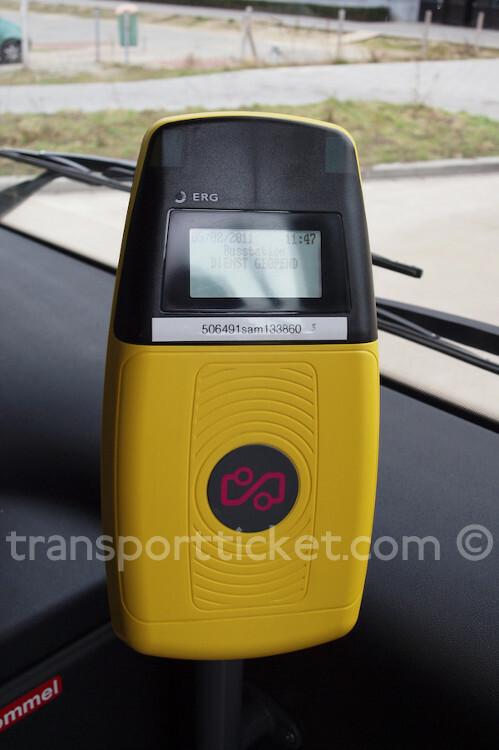 However in these cases some of the railway companies use the same validator. 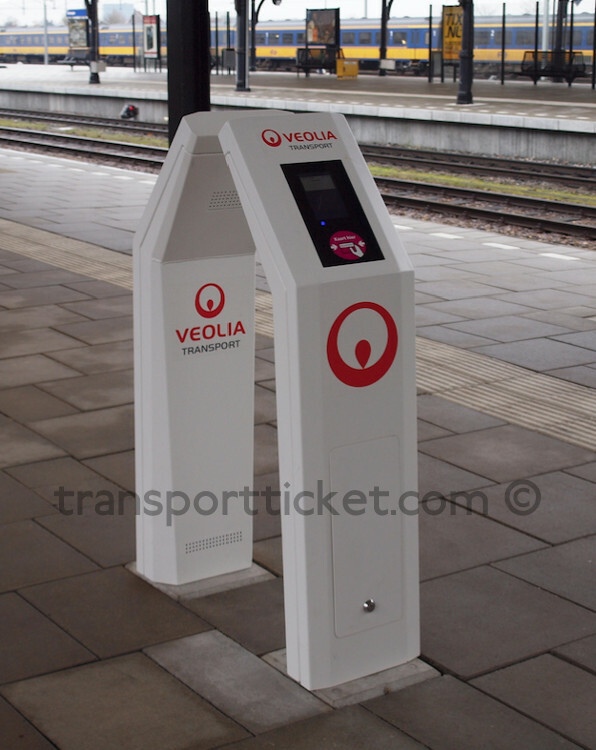 The result is a transfer point with only two different validators. 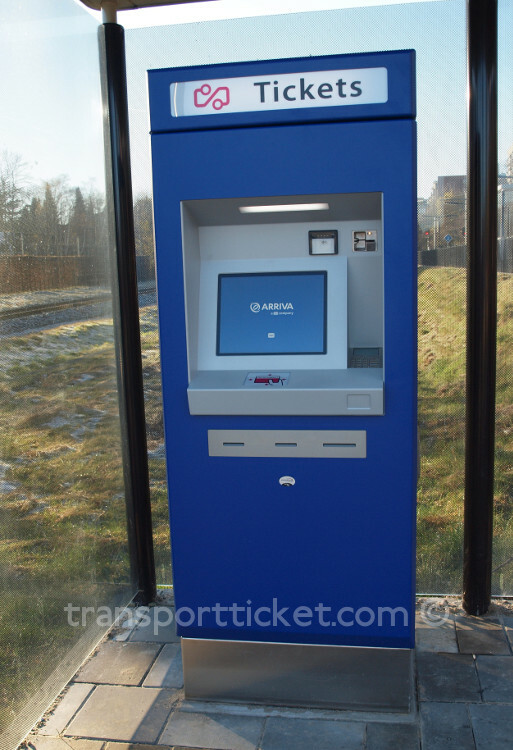 Not al machines have the same possibilities. 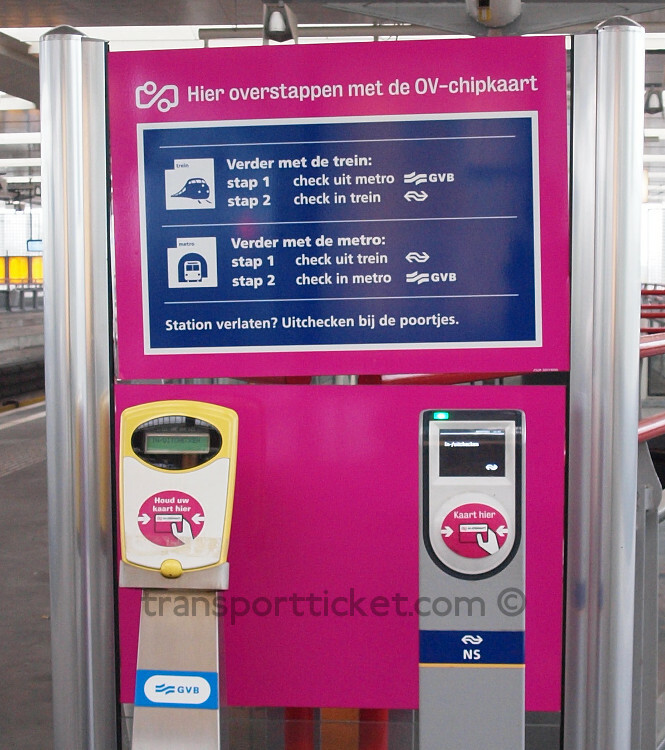 The OV-chipkaart is mainly valid in The Netherlands. 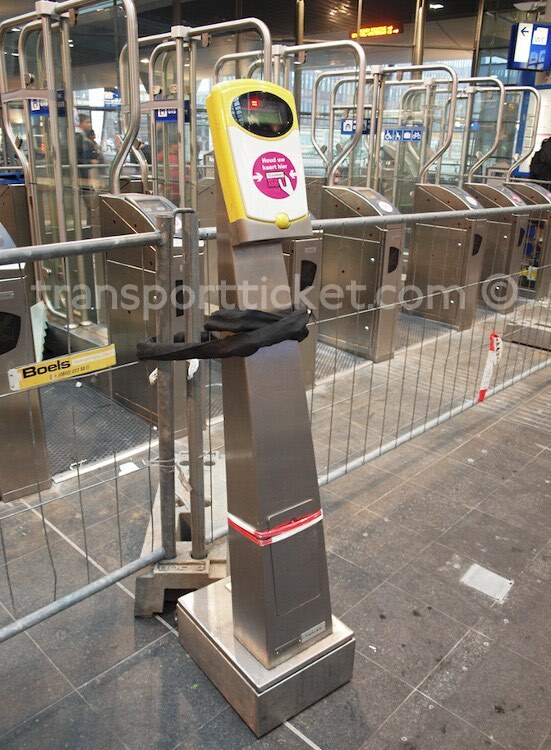 There are however some exceptions. 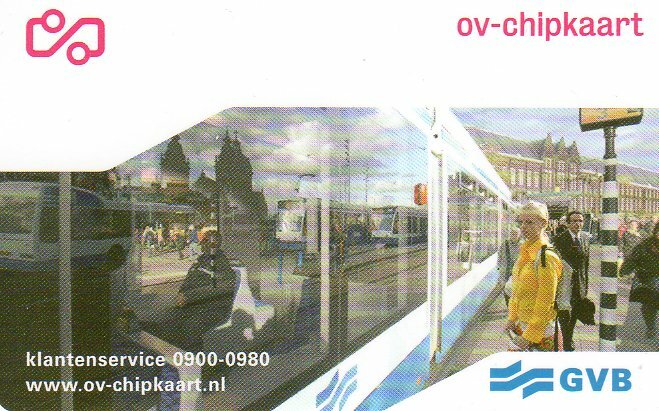 The OV-chipkaart is valid on a few bus lines that cross the border, eg from Maastricht to Aachen in Germany. 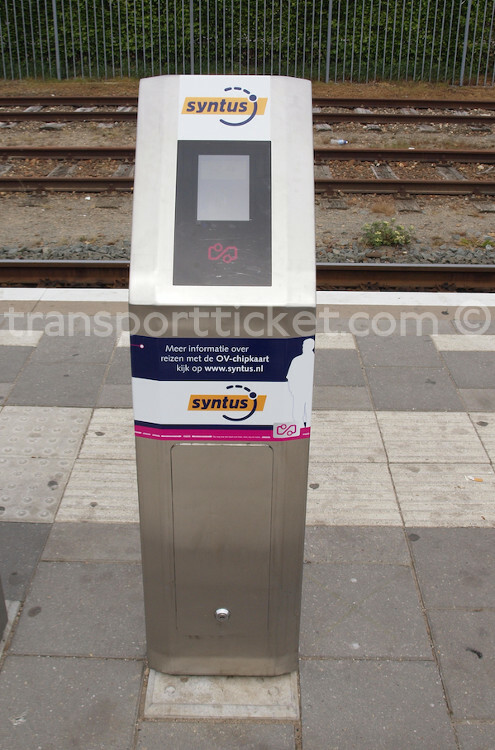 There are several railway stations in Germany that have OV-chipkaart equipment. 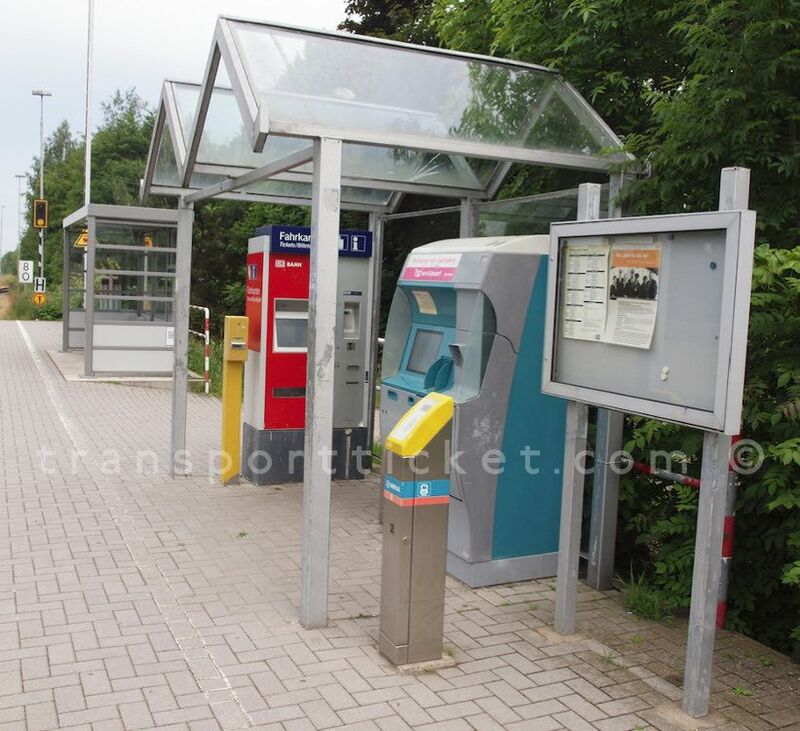 From the beginning of the OV-chipkaart two stations in Lower Saxony have had OV-chipkaart equipment: Weener and Leer. 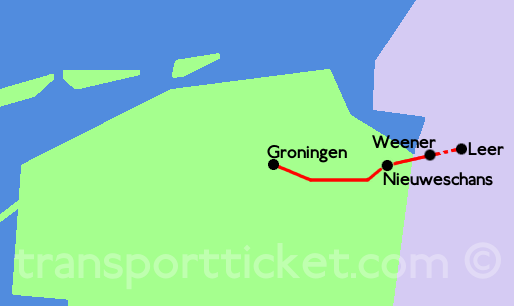 In December 2015 a ship collided with a bridge on a river between Weener and Leer. 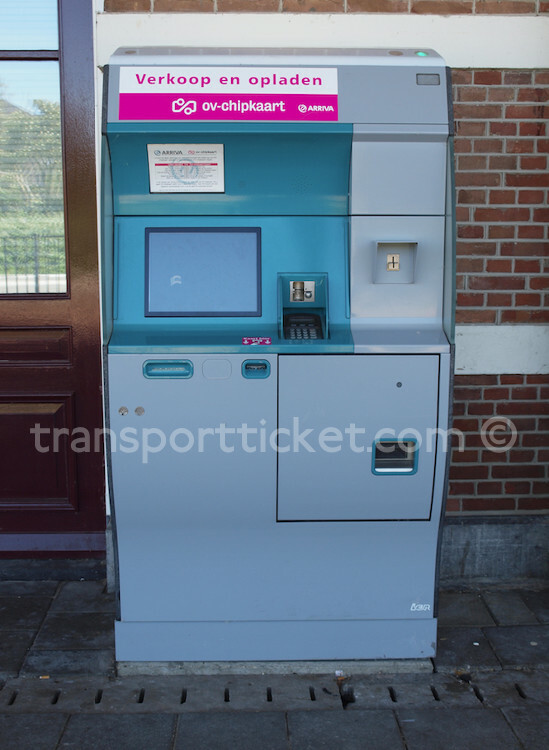 As the bridge was heavily damaged, there are currently no trains running to Leer, only replacement buses. 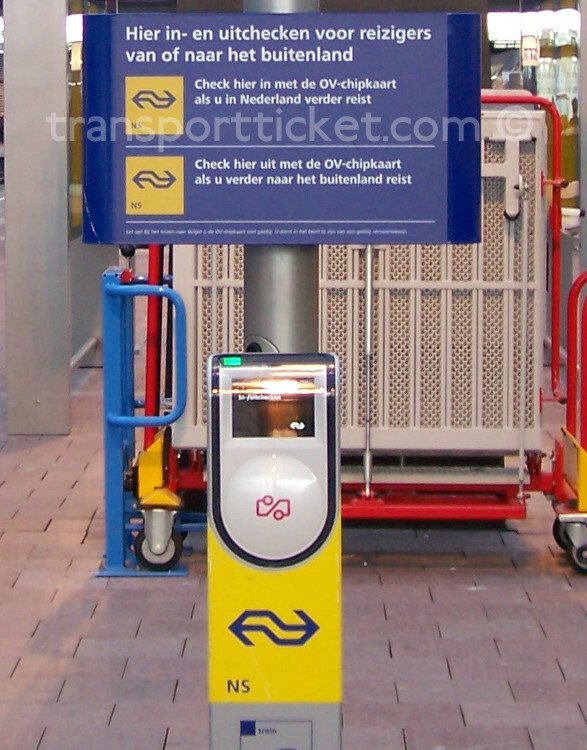 International travellers who want to enter or leave a station with ticket gates use a QR-code to open the gates. 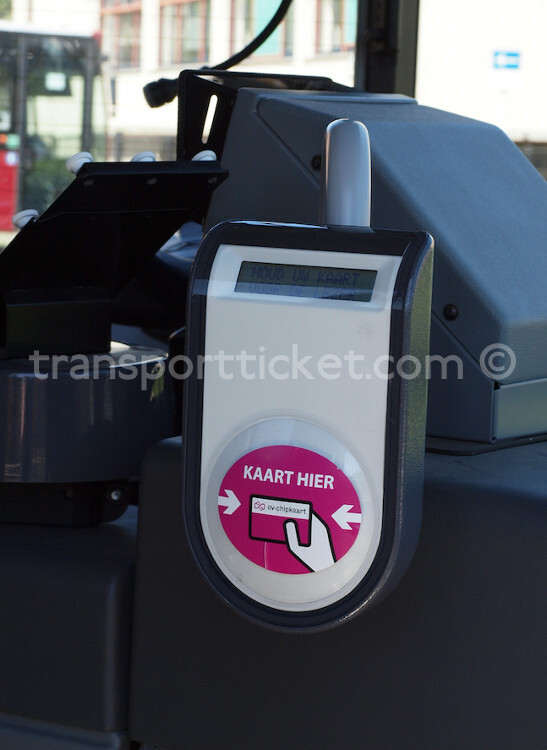 This QR-code can be printed on the ticket, but can also be on a key card. 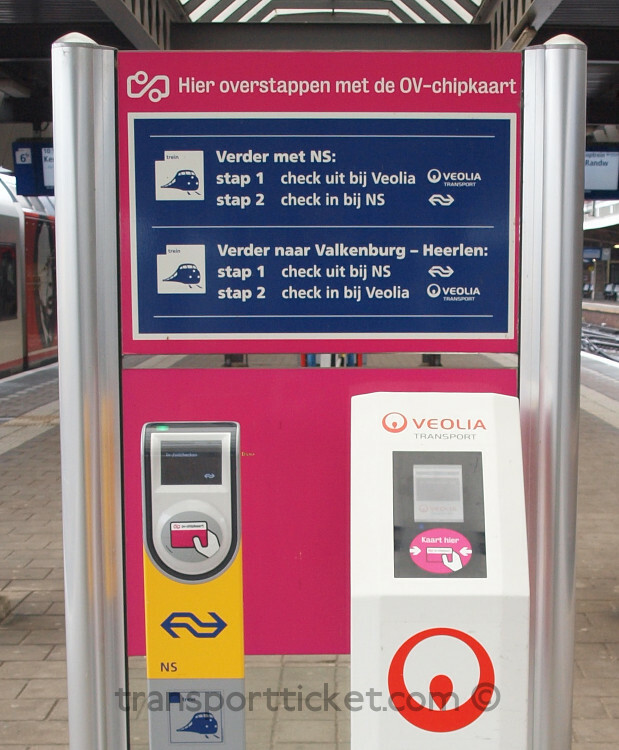 International travellers who begin or end their journey on national trains using the OV-chipkaart have to touch in or out at the interchange station. 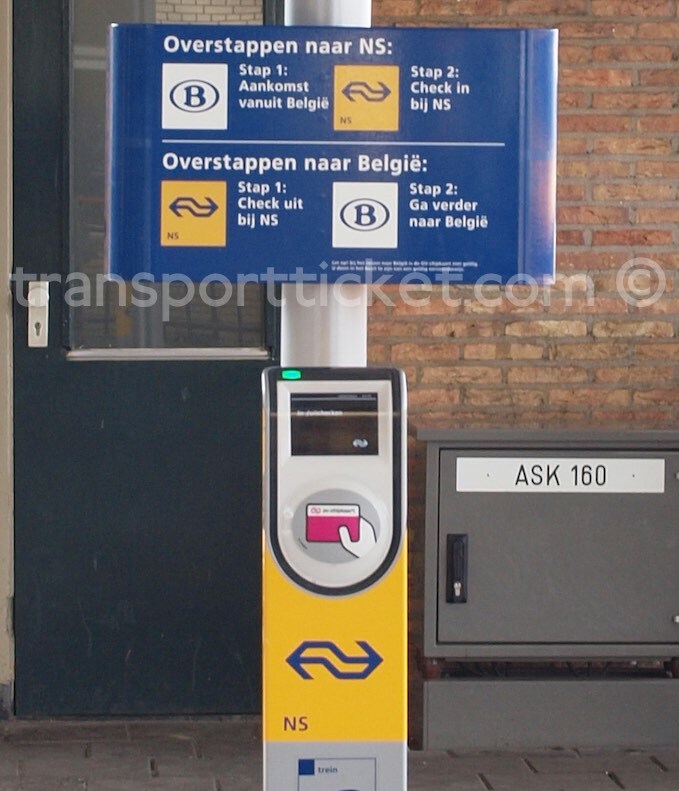 At some stations special transfer points are placed for that purpose. 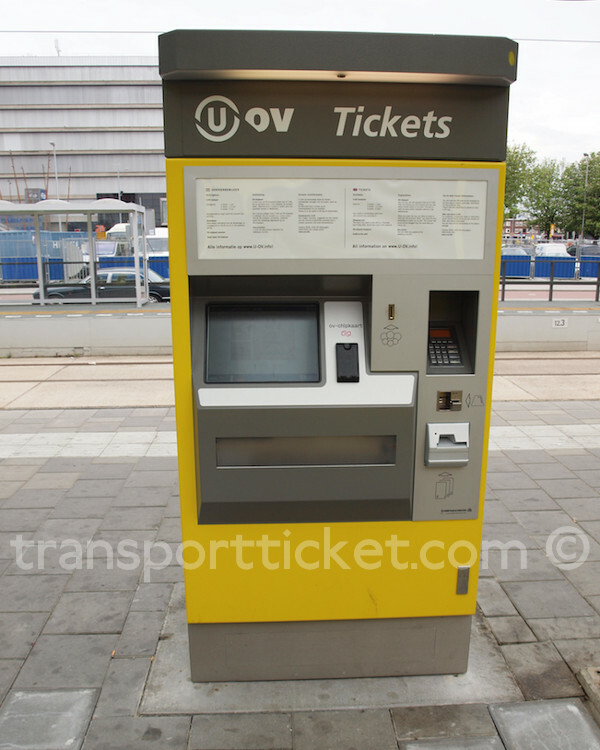 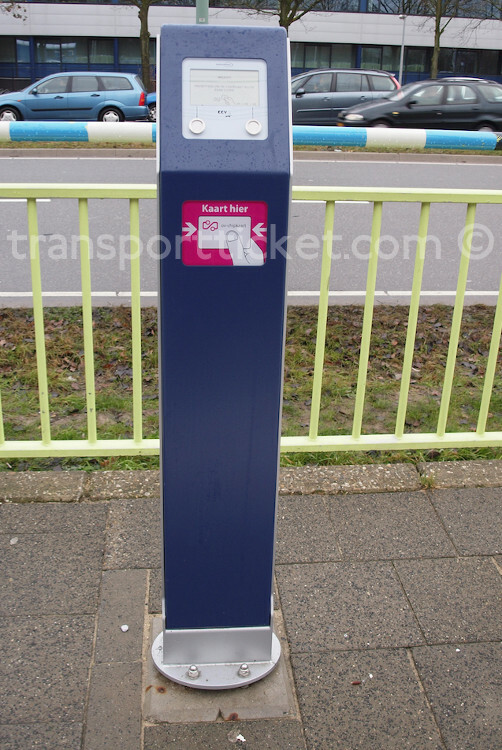 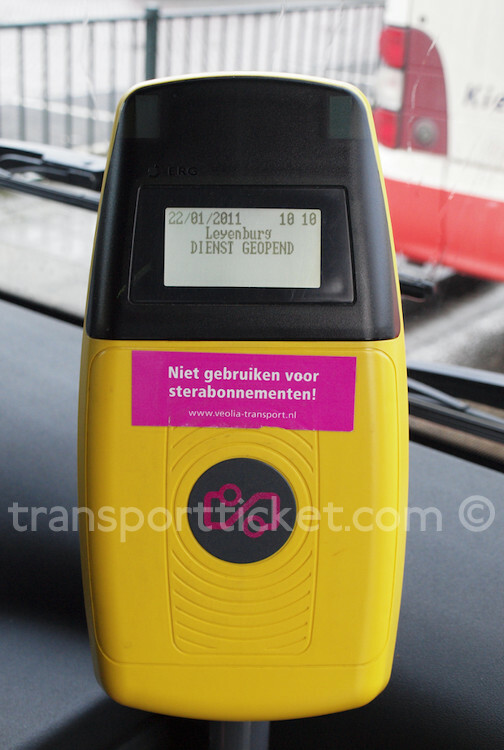 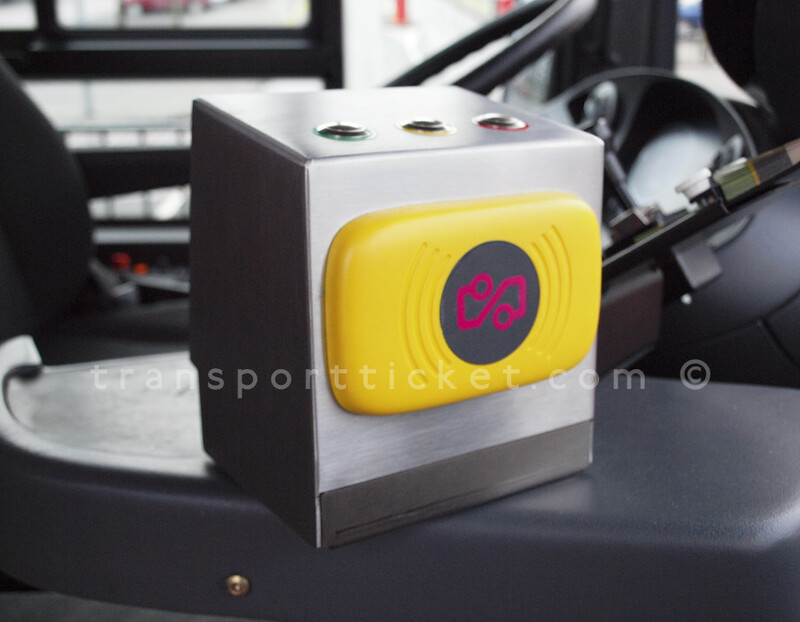 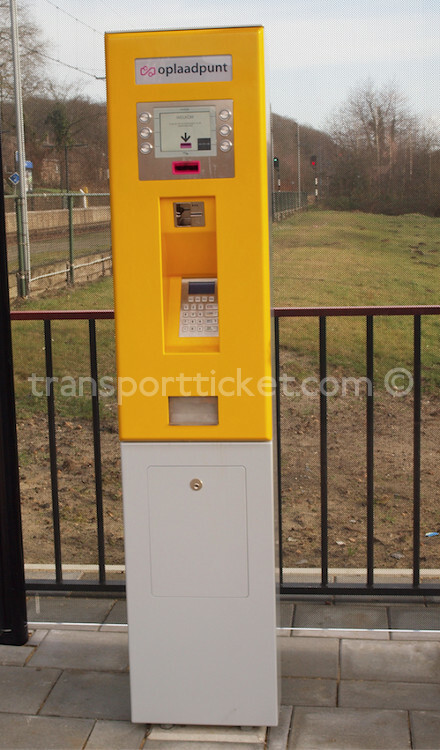 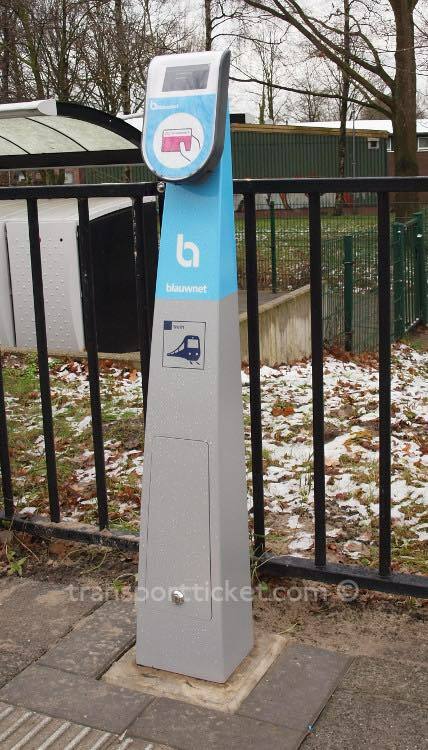 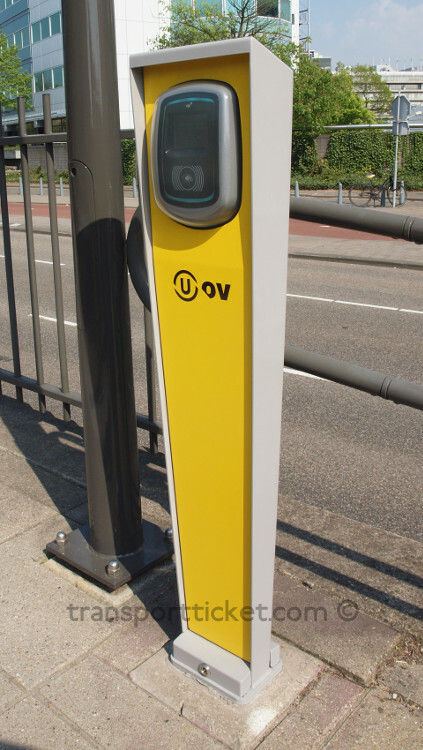 In January 2011 a test started to use the ov-chipkaart outside public transport. 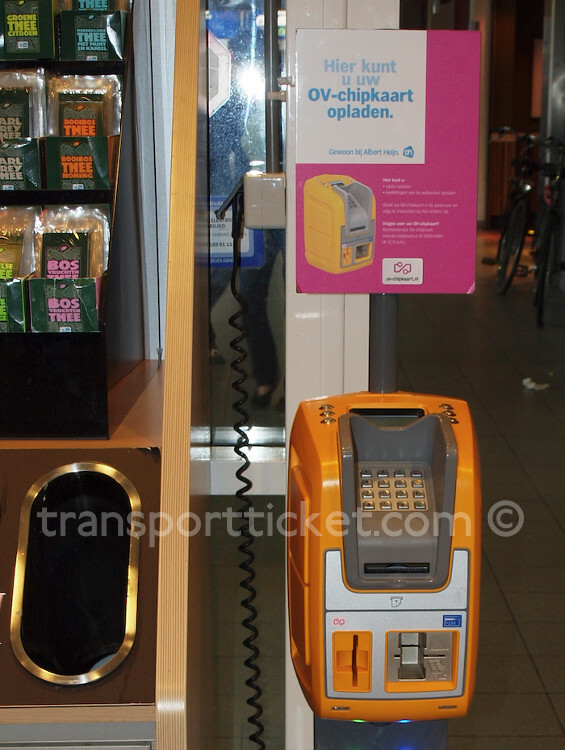 The ov-chipkaart can be used to be pay in the food stores at train station Amersfoort. 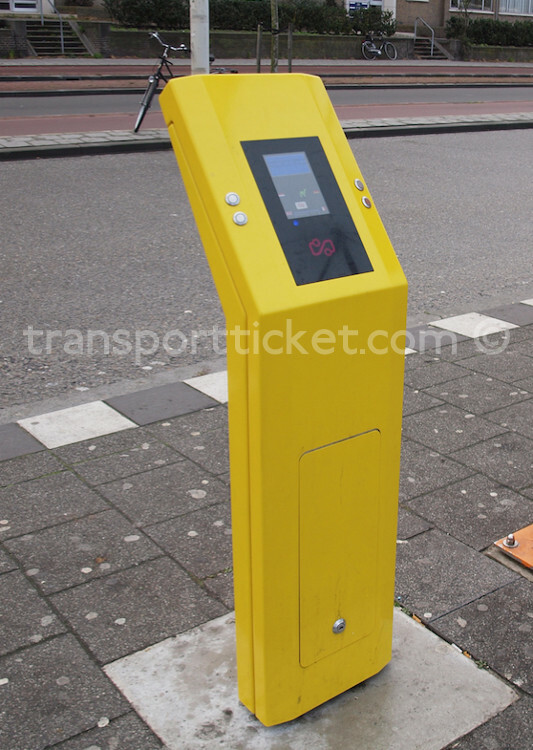 Only a limited number of people are selected to register for this trial. 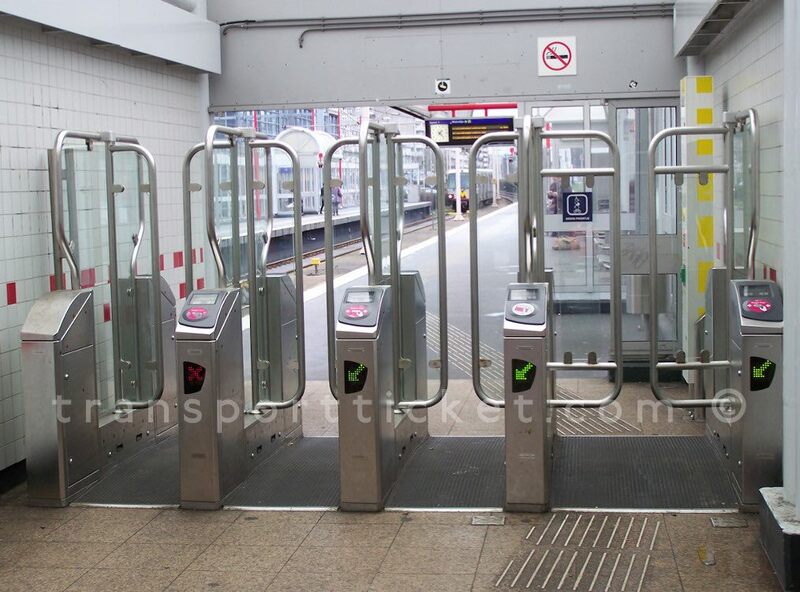 The results of this trial are unknown. 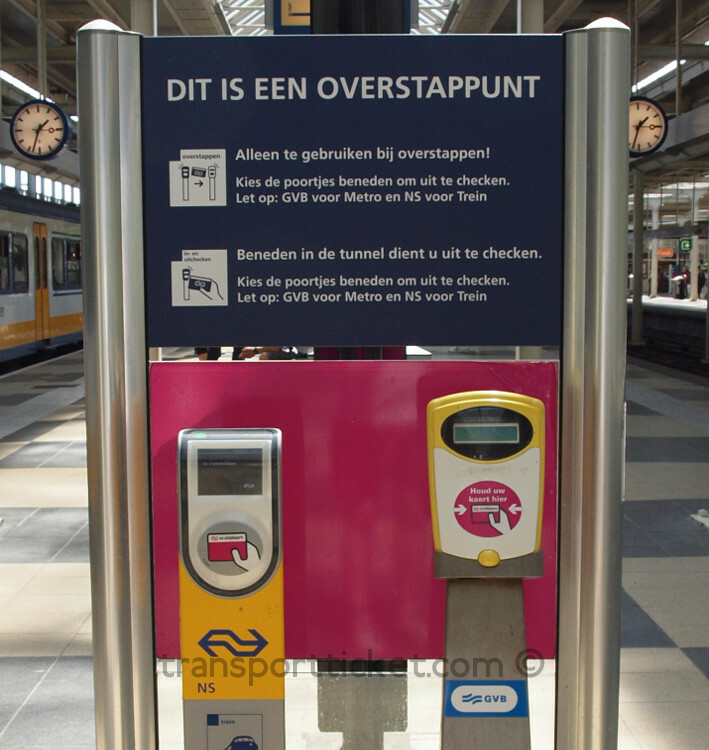 It is no longer possible to use the ov-chipkaart in shops. 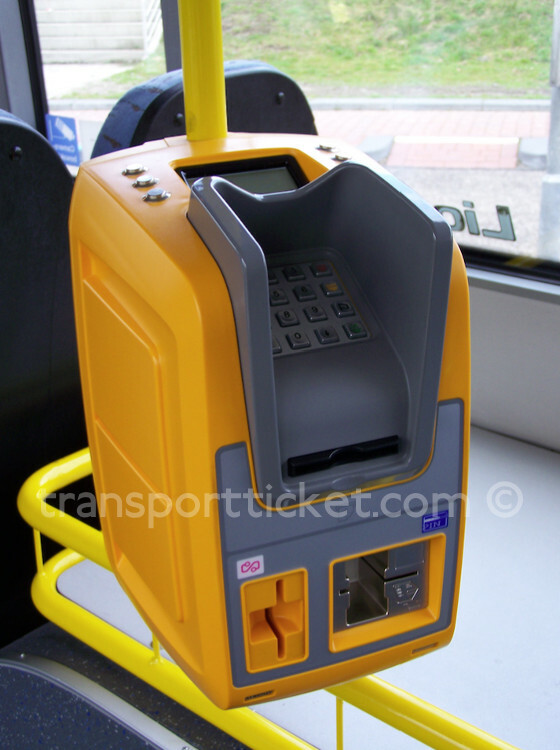 However nowadays regular debit cards can be used for contactless payments.